Somehow you need to be able to redim the array. Can you delete the grid box at any time? Then maybe set it up again with another numOfRows value? When you enter a another number of rows it sort of works but everything else goes wrong maybe you can figure it out? Thank you. The changes you have made do get over the problem of re-dimensioning the grid and yes, there are problems with the later code that needs changing to match the re-dimensioning and none of the maths seems to work. I'll look at this. As I mentioned above I find rolling my own faster and easier than trying to figure out how to use a GUI library. Perhaps these examples might give a clue as to how to solve the problem using redim? With regards the top horizontal row with description, number1, number2, total and left column with row1, row2 , total I would keep them separate from the actual array of editable text box array. RNBW wrote: The changes you have made do get over the problem of re-dimensioning the grid and yes, there are problems with the later code that needs changing to match the re-dimensioning and none of the maths seems to work. I'll look at this. Because I don't know what the API is doing there may be other problems. It seems to me that there should be the ability to delete a control and just create a new one in order to resize the array. You don't want to be simply creating extra controls over the top of the previous ones. I have got most things working, but not all. For some reason the data entered into the first row off calculation is being ignored. It may be that the original grid may have to be deleted first. I'm looking at a few workarounds. to create a "massive" memory leak! Delete previous array (using Erase), freeing mem. I've had another go at the code. I've considered REDIM but it is not actually needed. The sizing of the array will only be required once (I shall look to hide the first row of gadgets after the grid has been sized). I've REMd the initial setUpGrid() at line 152 to achieve this. Generally, the program works, all except for the totalling in the last column of the totals of the rows. I'm not sure why. 'included for my own future use. 'character. It will also print out ".123" as "0.123" and "-.123" as "-0.123"
' Total of the rows in the last column doesn't work.
' As can be seen, the displayed numbers are a bit straggly.
' 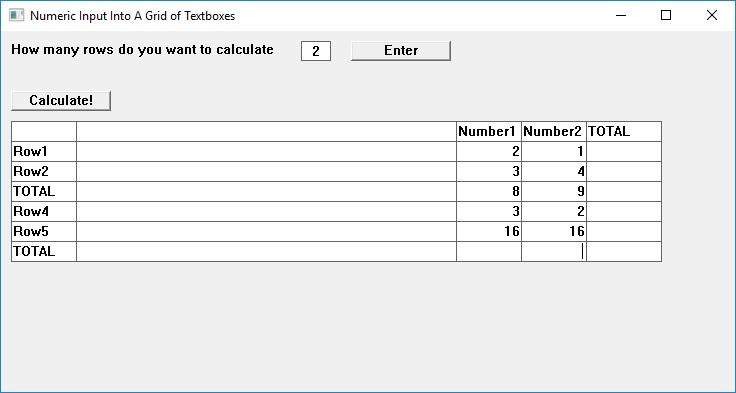 Format the numbers to a specific number of decimal places. 'Function to check that character input is 0-9, - or . RNBW wrote: I've had another go at the code. I've considered REDIM but it is not actually needed. Well a version of Redim of a grid control probably is needed for reasons mentioned. You are probably generating a another grid control rather than resizing the same grid control. The ability to resize the number of rows or columns in a grid control should be one of its methods. A messy work around without really knowing what you are doing is fraught with dangers. It seems to me if there is no resize method you would need to have a delete control option followed by an add a new control to hack a resize function. I am strictly a retro programmer who makes his own GUI controls, the workings of which I do understand. I can write my own grid control with a resize method if needed. By the way you do not need to credit me with any "modifications" as they are only suggestions not working solutions. and it seems to work still. By the way, crediting you in the code is just my way of saying thank you to those who help me out with code. If you would rather I didn't please say and I will delete. RNBW wrote: By the way, crediting you in the code is just my way of saying thank you to those who help me out with code. If you would rather I didn't please say and I will delete. I will let you know if I offer anything I want credit for. Somethings I would rather not admit to coding :) Thanks anyway. Which makes me wonder if one grid control is being created and displayed over a previously created grid control. Instead of redimensioning the grid you might be just creating more and more of them. Another glitch is the contents of a textbox might not displayed unless it is clicked. To me this illustrates that using a restricted library may make some things easy but other things impossible. I noticed the same as you with the scenario that if you re-entered a grid size smaller than the previous, there would still be some of the previous grid showing. Definitely not what I want. Unfortunately, I didn't see it until after I'd posted and I was on my way to bed. Not too critical for me because I will only want it for a single use. I'm currently scouring the internet for methods of deleting WinAPI controls. I may also look at different libraries to see if they are more flexible. One day, I might have a go at coding my own GUI. I might have a look at yours and Lothar Schirm's 'home grown' GUIs as starters. I do appreciate the help you have given. It's very helpful to have another set of eyes looking at what you are trying to produce. One can code with blinkers! 'As can be seen, the displayed numbers are a bit straggly. Not quite the presentation I was looking for, but it works. RNBW wrote: I'm currently scouring the internet for methods of deleting WinAPI controls. So no luck? I did the same. And there appears to be methods to an add and remove a whole control not just a row or column in a grid control. But I have no idea how to do that in FreeBASIC. Perhaps post the question to the Windows section of this forum? I haven't tried your code or the gui library you are using but shouldn't a simple DestroyWindow call do the trick? Yes, DestroyWindow does the trick. Sending WM_CLOSE, too, and to me it looks less rude. I tested both of them, of course. No idea, though, what will happen under the hood. If I had to destroy/close a Million controls in a tight loop, I would probably investigate. I did see a few things in various programming dialects, but, like yourself, wasn't sure how to do in FreeBasic. Unfortunately, the link didn't work.
' Totalling the rows and columns doesn't work.